March is here! With so many great movies coming out this month we didn’t know where to start. Fortunately, a rather big one (or at least its main character is) is coming out this week! That movie is none other than Kong: Skull Island. 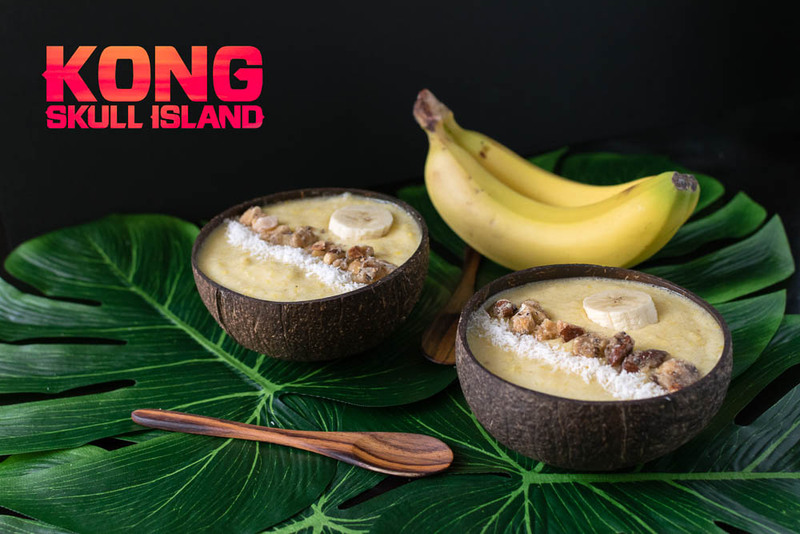 After the success of Peter Jackson’s King Kong, this movie is highly anticipated and we knew a recipe was in order, thus Kong’s Banana Smoothie Bowl came to be. 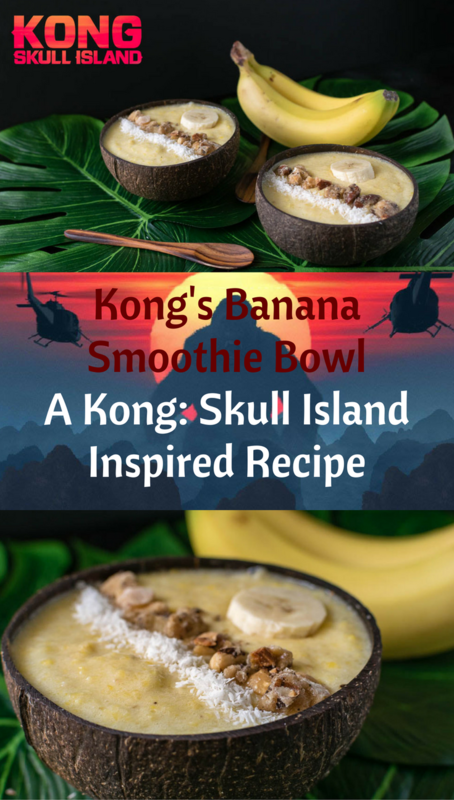 When coming up with our idea for a Kong: Skull Island inspired recipe, we looked at a few things. First, we knew we wanted to have bananas be the focus. Since we had already done a frozen banana pop recipe, we looked for an alternative. With the popularity of the smoothie bowl, we decided to give one a shot. To be honest, it also gave us a reason to get some pretty neat coconut bowls. All you have to do is enter below. The winner will be chosen on Sunday, March 12th! Good Luck! Combine first 4 ingredients in a blender. Blend and divide into 2 bowls. Top with Kona Coffee Banana Macadamia Nut Crunch and Coconut. *The Geeks received no other compensation to facilitate this write-up; opinions are wholly our own. Prize pack and tickets provided by Allied Marketing. View our Disclosure Policy for more info. OMG I have all these ingredients! This almost never happens! I am wayy too excited now! YUM! Looks so refreshing and perfect for summer! Definitely can’t wait to try this one out. That would so much fun on a beach party!! My kids loved the movie Skull Island so these would be fun with them. The mango and pineapple sounds so refreshing.. The smoothie looks perfect for summer and what a great idea to serve them in a coconut shaped bowl. I’d try them soon. Smoothie bowls are great for breakfast or lunch. Love the flavours going on here….and the bowl is so cool. I really love a good smoothie bowl especially during the warmer months. This is such a great combination of flavors in this and it includes all of my favorites. Yummy! The tropical flavors in this transports you to an island paradise. I can’t wait to try this! That smoothie bowl is my kind as it all my favorite mango, pineapple, banana and coconut. you can’t go wrong with coconut yes they give delicious boost. I need that bowl for my breakfast. 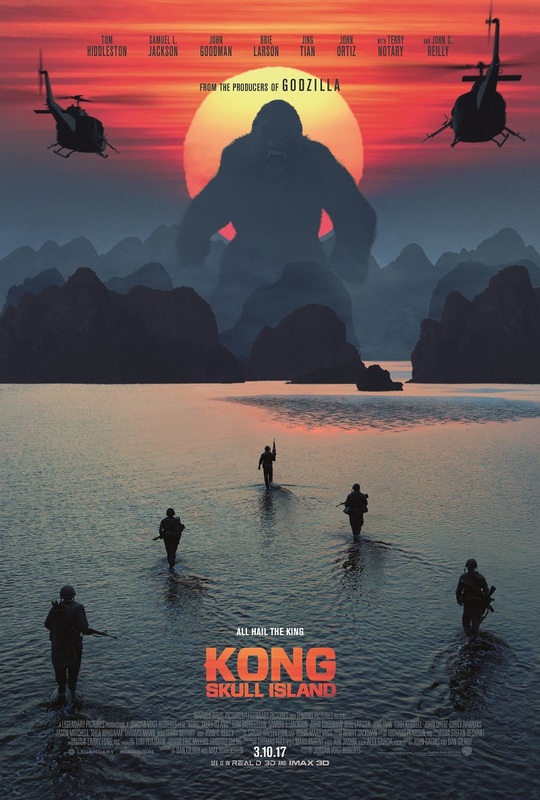 I’ve seen the Kong movie, not sure if this one though, but it was really good. Same as this yummy smoothie bowl, love the tropical flavours. I love me a good smoothie bowl – it looks perfect and delicious, and a lovely breakfast to look forward to. Can’t wait to try!